Every New Year is a new Beginning and a new resolution. 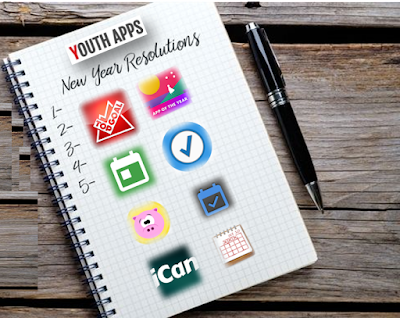 Youth Apps has provided you with Latest Eight Resolution Tracking and Monitoring mobile app for this 2018. My New Yearâ€™s Resolutions List lets you keep track of your resolutions! Change your habits achieve your goals track your progress for better life. Take the free 52 weeks money challenge app and reach your saving goals! Track your progress at achieving daily goals. Build streaks to change your life! GoalTracker helps you track your goals and achieve the success in your life. Best habit tracker app is here. Track your new year resolutions easily. Habitual is a mobile app to track your new years resolutions. Useful for to-do lists and brainstorming! Track your progress at achieving daily goals. Build streaks to change your life. Make a new year resolution or set a new goal and track it every day in 2018 . Quit Smoking? Do more Workouts? This app shows you how much time has passed! 19 Days from Now, Reset Your Habits and Rewire Your Brain. Start Now? Are you the person you want to be? Not yet! Form habits sustainably with NotYet. Time to take your New Year Resolutions Seriously. Tracker, motivation, discuss. Routinely helps in developing good habits by providing daily reminders. Food Tracker App with Meal Planner and Nutrition Calculator to Lose Weight. Track the daily activities that are important to you. Shape up with quick and easy, fat-busting fitness workouts that anyone can do. The ultimate workout tracker, weight training, and strength training app. Goal tracker for the absent minded. Track habits easily with simple swipes.